Home politics Is Lokesh future TDP boss? 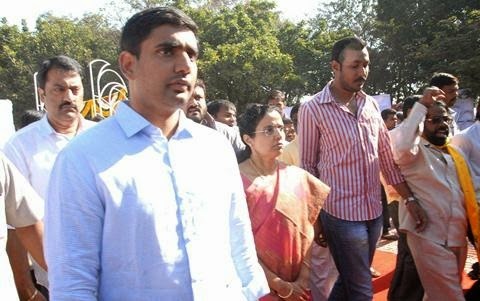 Is Lokesh future TDP boss? Is Chandrababu Naidu trying to position his son Lokesh as a doughty fighter and a future TDP boss? Is that the reason why Nara Lokesh is firing social media salvos? Lokesh has been virulently attacking Telangana CM KCR through his tweets. "Does KCR have guts to debate with @ncbn on who developed TS? Why is there power crisis in TS? And how brand Hyderabad is being destroyed," was the first twitter taunt of Lokesh. However, KCR fielded junior level leaders to take on Lokesh. Some TRS ministers agreed to pick up the gauntlet, but Lokesh was quick to provoke KCR again through his second tweet. "Proved once again! KCR has no guts to debate with @ncbn, he wants to send his ministers to waste time & mislead the citizens of TS," he said. "First question your father. Why he has not taken into consideration the Sivaramakrishnan Committee report?. Why he has not kept his word on loan waiver scheme." Interestingly, while Lokesh is seeking refuge in the insularity that social media offers, KCR is fielding minions to take on Lokesh. Was this an attempt on the part of TDP supremo to project his son as a fighter who has the audacity to take on the might of KCR? Is KCR trying in his own inimitable style to show Lokesh that he still has a long way to go?